Oconee County Commissioner Chuck Horton has decided to take the lead in studying the stream and wetland mitigation resolution before the Board and said he plans to report back to his colleagues on his findings. Horton made the announcement of his intention during the section of the Board of Commissioners meeting last Tuesday night that is set aside for the comments of commissioners. As Horton noted, the issue had come up at the town hall meeting the commissioners held at the Civic Center on Feb. 16, when more than a half dozen citizens spoke out in favor of it. The resolution would put the Board of Commissioners on record with the U.S. Army Corps of Engineers as favoring restoration of streams and wetlands in Oconee County or upstream from the county when the Corps grants permits allowing the piping, filling or other alteration of streams and wetlands in the county. When the Corps issues permits, it require mitigation of that damage, usually by restoration of streams and wetlands damaged through such things as pasturing, dredging or earlier construction. At present, the restoration should be in the North Oconee River watershed, but not necessarily in the county. Katie Sheehan, an attorney at the River Basin Center in the Eugene P. Odum School of Ecology at the University of Georgia, drafted the resolution after I talked with her about mitigation issues in the county. I asked the BOC in April of 2009 to consider the resolution. At its meeting on May 5, it sent the resolution to the Citizen Advisory Committee for Land Use and Transportation Planning for review. That Committee decided on Nov. 10 not to recommend that the BOC approve the resolution after Wayne Provost, strategic and long-range planner for the county, advanced a series of arguments against it. Committee Chairman Abe Abouhamdan reported that vote to the BOC in November, but the full commission has not taken up the resolution for its own review. At the town hall meeting, all five commissioners stated support for mitigation of damage to local streams and wetlands inside the county or upstream from the county, though they also raised questions about the resolution stating that preference. Horton told me in a telephone conversation today that he has already spoken to people at the Northeast Georgia Regional Commission and the Georgia Department of Community affairs and “will try to educate himself” by talking to attorneys with expertise on the matter. He said he also plans to talk to the Corps of Engineers and will work with county Administrative Officer Alan Theriault on the issue. He said he is willing to talk to anyone else who is interested in the resolution. I was not able to attend the meeting on Tuesday because of a travel commitment. The report on the meeting in The Oconee Enterprise, the only paper to cover it, did not mention Horton’s statement regarding the resolution. 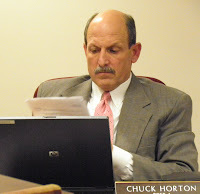 The minutes of the meeting, released by County Clerk Gina Lindsey on Friday, included the comment by Horton about his plans to study the resolution and report back to the other commissioners.